LYNCHBURG, VIRGINIA--Claudia Lane's return to the track marks an important milestone for the two-time Foot Locker Nationals winner. The Malibu (CA) High School senior's first race on Friday at the third annual The VA Showcase in Lynchburg, Virginia, in the girls invitational mile will be the first time the Dartmouth College signee will have competed in an indoor race. Lane will race at approximately 5:40 p.m. EST on Friday in the girls mile and will return to the track in the 2-mile on Saturday at 2:10 p.m.
"I always push myself in races," Lane said Thursday in a pre-meet press conference at Liberty University's indoor track and field facility. "I'm going to try to stay in the group of girls and see how hard I can push tomorrow and what I can do the next day. I'm just trying to get back into what racing feels like." Lane will race against Nike Cross Nationals qualifier Tsion Yared, three-time Foot Locker Nationals qualifier Taryn Parks and up-and-coming Alabama sophomore Miles Presley in the mile and will follow in the 2-mile against two-time All-American (NXN and Foot Locker Natoinals) Taylor Ewert, Yared and Miles. "I can't compare the runner I am now to my old self," Lane said. "But I'd say that I'm just in the best shape I can in at this time and I'm just going to keep training and keep improving." Lane will be returning to competition after a difficult stretch of injuries that has limited her for the past nine months. A few starts and stops have unfortunately plagued the national-caliber athlete, who shut down her junior track and field season after The Mt. SAC Relays in 2018 due to a stress reaction that flared up. That meant the defending 3200m champion in California was unable to defend her title as a sophomore. When cross country resumed in the fall, Lane dealt with another setback in her foot, and ensuing issues with her IT Band. Lane said Thursday that she and her coach decided to plan long-term for the end of her senior year, planning first for an indoor meet here in Virginia and then later for the spring track and field season. 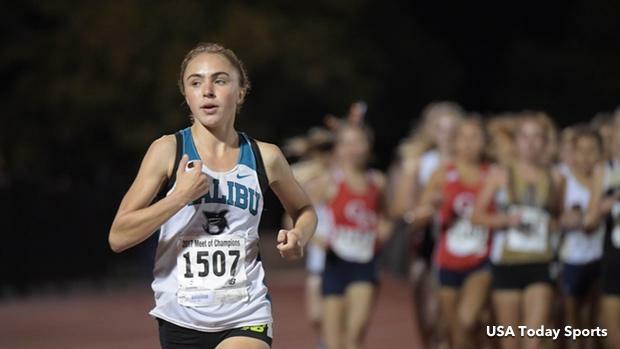 That plan ultimately meant that Lane was unable to defend her two straight championships at the California Interscholastic Federation state championships, and at Foot Locker Nationals. But while those moments are now a part of her story, Lane knows those setbacks are only part of a larger career that will continue at Dartmouth. Lane said she's been running pain for, and consistently, for the past month and heads into The VA Showcase following a few successful 1200m and 800m workouts. "I'm super excited for tomorrow and the next day," Lane said. "I'm not expecting to win. I've only been training consistently for a month now. I had another IT band issue. But I'm excited to race again and put myself out there. It might make me feel a bit vulnerable, but I'm excited for that anyway."